Aristarchus of Samos (/ˌærəˈstɑːrkəs/; Greek: Ἀρίσταρχος ὁ Σάμιος, Aristarkhos ho Samios; c. 310 – c. 230 BC) was an ancient Greek astronomer and mathematician who presented the first known model that placed the Sun at the center of the known universe with the Earth revolving around it (see Solar system). He was influenced by Philolaus of Croton, but he identified the "central fire" with the Sun, and put the other planets in their correct order of distance around the Sun. Like Anaxagoras before him, he suspected that the stars were just other bodies like the Sun, albeit further away from Earth. His astronomical ideas were often rejected in favor of the incorrect geocentric theories of Aristotle and Ptolemy. Copernicus had attributed the heliocentric theory to Aristarchus. You are now aware ['you' being King Gelon] that the "universe" is the name given by most astronomers to the sphere the center of which is the center of the earth, while its radius is equal to the straight line between the center of the sun and the center of the earth. This is the common account (τά γραφόμενα) as you have heard from astronomers. But Aristarchus has brought out a book consisting of certain hypotheses, wherein it appears, as a consequence of the assumptions made, that the universe is many times greater than the "universe" just mentioned. His hypotheses are that the fixed stars and the sun remain unmoved, that the earth revolves about the sun on the circumference of a circle, the sun lying in the middle of the orbit, and that the sphere of the fixed stars, situated about the same center as the sun, is so great that the circle in which he supposes the earth to revolve bears such a proportion to the distance of the fixed stars as the center of the sphere bears to its surface. It is a common misconception that the heliocentric view was held as sacrilegious by the contemporaries of Aristarchus. This is due to Gilles Ménage's translation of a passage from Plutarch's On the Apparent Face in the Orb of the Moon. 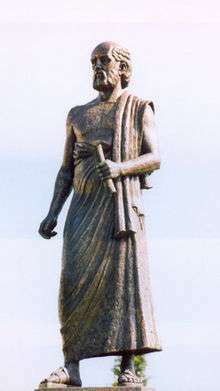 Plutarch reported that Cleanthes (a contemporary of Aristarchus and head of the Stoics) as a worshipper of the Sun and opponent to the heliocentric model, was jokingly told by Aristarchus that he should be charged with impiety. Gilles Ménage, shortly after the trials of Galileo and Giordano Bruno, amended an accusative (identifying the object of the verb) with a nominative (the subject of the sentence), and vice versa, so that the impiety accusation fell over the heliocentric sustainer. The resulting misconception of an isolated and persecuted Aristarchus is still transmitted today. According to Plutarch, while Aristarchus postulated heliocentrism only as an hypothesis, Seleucus of Seleucia, a Hellenistic astronomer who lived a century after Aristarchus, maintained it as a definite opinion. In his Naturalis Historia, Pliny the Elder later wondered whether errors in the predictions about the heavens could be attributed to a displacement of the Earth from its central position. Still, no stellar parallax was observed, and Plato, Aristotle and Ptolemy preferred the geocentric model, which was held as true throughout the Middle Ages. The heliocentric theory was successfully revived by Copernicus, after which Johannes Kepler described planetary motions with greater accuracy with his three laws. Isaac Newton later gave a theoretical explanation based on laws of gravitational attraction and dynamics. The only surviving work usually attributed to Aristarchus, On the Sizes and Distances of the Sun and Moon, is based on a geocentric world view. 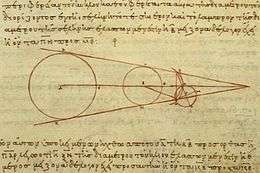 It has historically been read as stating that the angle subtended by the Sun's diameter is 2 degrees, but Archimedes states in The Sand Reckoner that Aristarchus had a value of ½ degree, which is much closer to the actual average value of 32' or 0.53 degrees. The discrepancy may come from a misinterpretation of what unit of measure was meant by a certain Greek term in Aristarchus' text. Aristarchus claimed that at half moon (first or last quarter moon), the angle between the Sun and Moon was 87°. He might have proposed 87° as a lower bound, since gauging the lunar terminator's deviation from linearity to 1° accuracy is beyond the unaided human ocular limit (that limit being about 3° accuracy). Aristarchus is known to have also studied light and vision. Using correct geometry, but the insufficiently accurate 87° datum, Aristarchus concluded that the Sun was between 18 and 20 times farther away than the Moon. (The true value of this angle is close to 89° 50', and the Sun's distance is actually about 400 times the Moon's.) The implicit false solar parallax of slightly under 3° was used by astronomers up to and including Tycho Brahe, c. AD 1600. Aristarchus pointed out that the Moon and Sun have nearly equal apparent angular sizes, and therefore their diameters must be in proportion to their distances from Earth; thus, the diameter of the Sun was calculated to be between 18 and 20 times the diameter of the Moon. ↑ Draper, John William (2007) . "History of the Conflict Between Religion and Science". In Joshi, S. T. The Agnostic Reader. Prometheus. pp. 172–173. ISBN 978-1-59102-533-7. ↑ George Kish (1978). A Source Book in Geography. Harvard University Press. p. 51. ISBN 978-0-674-82270-2. ↑ Louis Strous. "Who discovered that the Sun was a star?". solar-center.stanford.edu. Retrieved 2014-07-13. ↑ Joseph A. Angelo (14 May 2014). Encyclopedia of Space and Astronomy. Infobase Publishing. p. 153. ISBN 978-1-4381-1018-9. ↑ Heath, 1913, pp. 299–300; Thomas, 1942, pp. 2–3.